My name is Mary K. Johnson, and I am researching the Whitten families of Winston County, Mississippi. 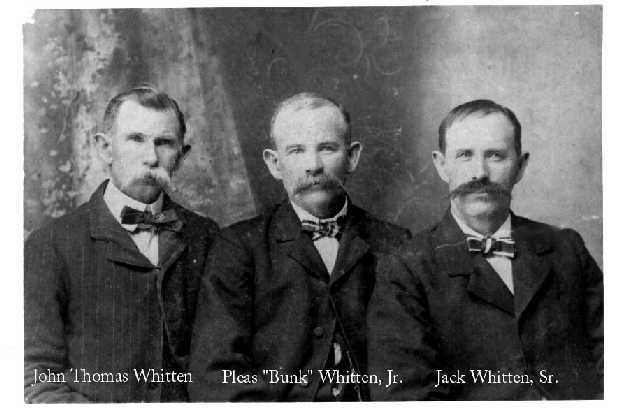 Brothers Pleasant and Austin Whitten immigrated to Winston County around 1848 from Edgefield District, South Carolina. Their children were reared in the Winston County area. Many of them later moved on to Texas. This page is dedicated to the descendants of Pleasant and Austin. Pleasant William Whitten was born in December 1824 in Edgefield District, South Carolina. Austin Whitten was born in 1820 in South Carolina. These men were children of Catherine Whitten (circa 1805-1843) and possibly Elijah Whitten (circa 1800 - 1835). Nothing is known of their life at home except that their mother Catherine died and that her estate was probated in Edgefield District, South Carolina in November of 1843. The only people who received a distributive share of her estate were Austin and Pleasant Whitten. Austin received part of his share of the estate in December 1844; and later, in December 1848, Pleasant was paid in full for his share of the estate and also for the balance of Austin's share. Were these men Catherine's only children or just her only surviving heirs? No one today can answer that question, but read on below for more information on this interesting and intriguing family of mine. My Whitten genealogy database (GED-COM) may be viewed on-line and/or downloaded for your use through Rootsweb.com and Ancestry.com. Click HERE for more information. Winston County Genealogy Links -- Links to other sites that have information on Winston County families. Cousin Finder Chart -- how to decifer those "twice removed" cousins of yours! WHITTEN -- The Family of Littleton and Lucinda Whitten -- Littleton and Lucinda Whitten were not from Winston County, Mississippi, but their sons Willie Jefferson Whitten and Rev. Henry M. Whitten lived in Winston, Attala, and Choctaw Counties in the early 1900's. These are my grandmother's family, while Pleasant Whitten is from my grandfather's family. Check out my other web site devoted to the family of Littleton and Lucinda. Beulah and Beyond: A Story of the Beulah Baptist Church and Community in Historical Perspective, 1835-1999, Choctaw County, Mississippi -- This book by descendant W.A. Whitten tells about the settlement of the Beulah community during the 1830s &45; 1850s and the beginning of the Beulah Baptist Church in the early days of the Civil War. It also chronicles the development of both church and community through the 1990s. Though similar to other rural churches its story is rather unique. The book is full of Beulah family names and their kin spread throughout the state and nation. Genealogy outlines are provided for the Carlisle, Joseph and Samuel Black families, together with the Bowie, Eddleman, Gladney, Hutchison, Lacey, Lane, McGee, Steele and Turnipseed families. This hardcover book is still available in limited quantities. Click the link above for more information on this wonderful book about this important community in Choctaw County, Mississippi. WHITE -- My White Family of Winston County, Mississippi -- Related surnames to this family include Wafford/Wofford, McGahey, and McArthur/McCarthy. TANKSLEY -- My Tanksley Family of Attala and Winston County, Mississippi -- Related surnames to this family include Burns, Guynes, and McCool and all related spellings of Tanksley/Tankesley/Tankesly/Tankersley/Tankersly. CUMMINGS -- My Cummings Family of Attala County, Mississippi -- Related surnames to this family include Whitten, Turner, Steed, and all related spellings of Cummings/Cumins/Cummins. CROWELL -- My Crowell Family of Winston County, Mississippi -- Related surnames to this family include Hill and Rogers. My Family Tree (Ancestor Chart) -- This chart shows four generations of my ancestors. If any of these lines looks familiar to you, e-mail me for more information. This site last modified on October 11, 2011. You are visitor number since January 10, 1999.